Beadwork from the earliest times has been used by the American Indians to decorate their leather bags, clothing and other articles, such as knife sheaths, cradle boards, and their lodgings. Clothes made of animal skins were quite often as elaborately decorated as possible. By the time Columbus discovered America, the Indians were already using beads for decoration. Beads made from shells, bones, claws, stones and minerals were used to make belts and decorate their clothing. Porcupine quills were also used as a way to decorate. The first record of trade in glass beads to American Indians was when Columbus landed on Watling Island in 1492. The trade beads were readily accepted by those Indians, and later by the mainland Indians. One style of the early trade beads the Indians used were called pony beads and were about 1/8th inch in diameter. Pony beads made their way in trade to the Plains Indians by 1800, where they had been using porcupine quills for geometric designs. Many times the glass trade beads were added to, or substituted for, their already existing form of decoration with porcupine quills or other types of beads. With the coming of glass seed beads (beads almost half the size of pony beads) to the plains in about 1840, the Indians were able to expand the variety and increase the intricateness of their designs. They soon developed an art that has not been surpassed. 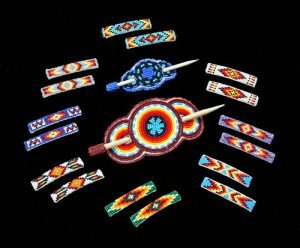 The beadwork designs done by the American Indians traditionally differ from area to area. The Lake Indians do mostly flowered designs, while the Plains Indians do mostly geometric designs. The Blackfoot and Northern Plains Indian’s designs are more massive than their Southern neighbors. Similar designs, however, are often found in many sections of the Unites States. This is due to the Indians being great traders and they will copy or adapt designs and articles they like for their own use.